Happy May Everyone! Here’s our Year of Giving original giveaway for this month. A signed 18″x18″ original collage piece worth over $500. I think this artwork is so fitting for May, don’t you? The rules of entry are below but I’ve added a bit of extra incentive for getting the word out. Simply leave a comment telling us why you love this artwork. ***And, if you refer a friend to enter, just have him or her mention your name and you get an additional 3 points! Giveaway ends May 7th at midnight CT. International entries are welcome. We are in the process of decorating my daughter’s big girl room for her second birthday. We need to make her nursery over for the baby on the way. She really loves looking for birdies outside. I swear she must have been a bird in another life because our house has been surrounded with them since she’s been born. There is a robin who loves to hang outside on our back porch and he flies into our sliding glass door all day long. I guess he sees his reflection in the glass and thinks it’s his girlfriend. Then we just noticed a robin’s nest in the tree right outside our front door. It’s like they know she loves birds so our house has become a dwelling place for them. This collage would look lovely in her new room. I love this piece! I work with special education students and we always talk about character being what we do when you think no one, not even little birds, are watching us! This would be a great visual for our room! What a beautiful piece of art! I love how sweet and springy it is! I love the colors in this piece! It would go nicely in the area in my TV room that I am going to make into a playarea! I think the colors in this piece would be perfect in my baby boy’s room. I love how simple it is, and I love that it is original. Gorgeous! This would look great in my daughter’s room! I also follow your blog so that’s two (2) entries. 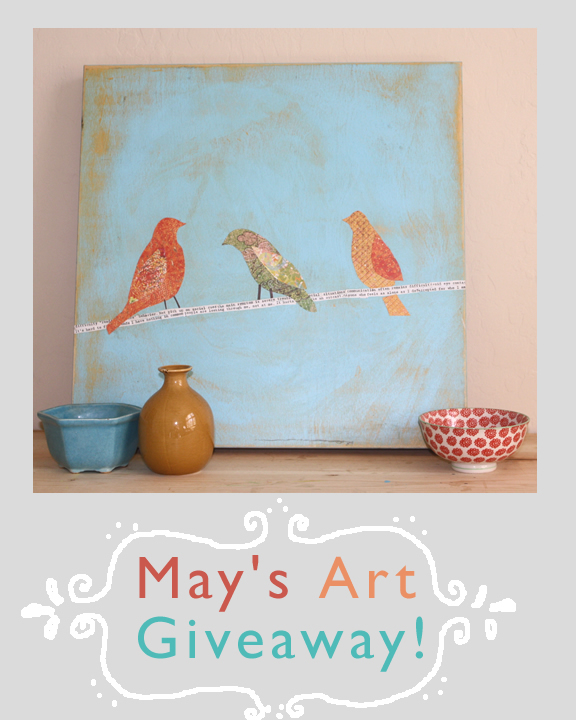 I’d love to win this — I’m in love with all things birdie! I love this! It owuld be perfect for my 15 month old son’s room. Birds are his favorite. I love the blue sky color and the sweet birds. This piece is simple and sweet. I love the texture and aged/vintage quality, such wisdom those little birdies posess. And as always, I appreicate the reuse of materials 🙂 Makes the earth happy. I love the simplicity of the design along with the colors which evoke calm and peace. Love it! So original and spring-y! Very simple and warm! Just love it!! Love the colors… so fresh and cheery! I love the use of materials in the collage. love this art work – the birds are just so cute and i love the fresh spring colors! I love the blue and orange together. They make me happy. I just redid my daughter’s bedroom with a birds on a wire theme. This totally captures the look I was going for. I LOVE this. It is so simple yet I can’t stop looking at it. love the peaceful feeling this artwork evokes! how lovely it would be to wake up and see this every morning! I love this! The colors are gorgeous. I love this painting! Baby #3 is coming in August and this would be perfect art to build the room around. I follow the blog as well! Just posted the giveaway on FB! Became a fan on fb. Love birds and the shabby chic look of it! The birdies are so sweet. This really would be perfect in my daughter’s room. I love the blue sky for when it is gray outside my window! I love the colors and patterns on this piece. Birds on a wire always make me smile. I joined on Facebook and I posted about your blog on my blog. I’m already a ‘follower’. So pretty! Love the blue/orange contrast. We are decorating my daughter’s room in the sky outdoor them with calming blues, pale greens and orange. I love how simple but beautiful this picture is and that its perfect for every age. Plus it teaches my kids creative ways to recycle. That is my very favorite shade of blue. Love it! we just moved into a new apartment, & are looking for ways to make it our own. i am collecting bird themed pieces for our living room… & this piece would be perfect. i love the bright cheerfulness of this piece… something to remind us of spring & summer when the grey winter doldrums are getting us down. here are my entries: following the blog, posting on my blog, posting on facebook, following on facebook. We love birds! My boys adore them and love any artwork that includes them (they produce a lot of their own bird art too!). They aren’t very focused when there are birds around. For example, doing homework: “2 + 2 equals, hey, look, a cardinal, and there’s a robin”–but how can you get mad about that. I love the simplicity and the colors! Love the colors and reminds me of my three little birdies! Think it will bring serenity to my guest room. I love birds and collage and my walls are very empty!!!! This is such a gorgeous piece! Would look great in my soon-to-arrive little one’s nursery. I’ve earned 5 “points” for the contest – follow blog, added blog link, posted about blog, became a fan on FB! Your art work always brings peace to my day. Months ago I was enjoying reading a blog “a place called joy” by lori jo rebeles I was led to your blog and art work. My three year old graand daughter has her room done in birds. She is always running to her bed room, which makes me blieve this a peaceful place for her. Your art work would have a goos home with her. My sister is expecting a baby boy in September and I am helping her design the nursery. I didn’t want a typical baby blue decor and stumbled upon your etsy shop. This print is perfect to incorporate cheerful variety of colors! 🙂 I love anything nature-themed. i would keep this in my room! i love it because it bring peace and reminds me of all the birds i am discovering here in michigan. I love it, because the colors match my house. Thank you. I love the simplicity of this piece of art. The colors are just amazing too! Lovely. So very lovely. I am so scared of birds, but just love that they are here…. We are getting ready for our next baby and I just received two of your prints through your etsy shop to put in the nursery. Their so beautiful. Following your blog. Beautiful artwork. I love your style so much! And I follow your blog (via Bloglines) and have added you as a “like” on Facebook = 2 extra entries. The colors are PERFECT for my nursery!! The 3 birds remind me of our family – mommy, daddy and baby – love it! love the blue and orange together, too. following your blog. I blieve that’s 3 entries total. Thanks! I love the colors and how the birds seem to be watching over and commenting on who is near this picture. It’s so simple and leaves room for anyone looking at it to create their own story! Is it possible to get alphabet cards in Tibetan? We have the English alphabet, but would like to have Tibetan since my daughter’s being raised bilingually. I love the different patterns on the birds and that their telephone wire is a bunch of words–it’s like you can see the conversations whizzing by! I’m a FB fan and a blog follower. I love the colors of this print. It’s beautiful and simple – that’s what I love about it! I love this artwork, because it reminds me of the bird mobile that my Mom made for my daughter’s nursery! This piece reminds me of new beginnings, new baby birds, new babies, new grandbabies and a new spring! I am so in love with this piece!! Beautiful! I have a thing for birds in artwork. And the color of the background is gorgeous! Love the colors – would be perfect in a boy or girl’s room! « Show us your Room- and win $250! !